I have several scorpions as pets (or better "pets"). They are kept separate since they can be cannibalistic at times. I have seen one scorpion attacking another and eating it some time ago because I put the two together without being aware of this behavior. Some species can live together, but the saying among hobbyist is: scorpions are communal to some degree until they start to eat each other. The degree depends on the species, but also on the individuals. Male Centruroides flavopictus found on our roof. 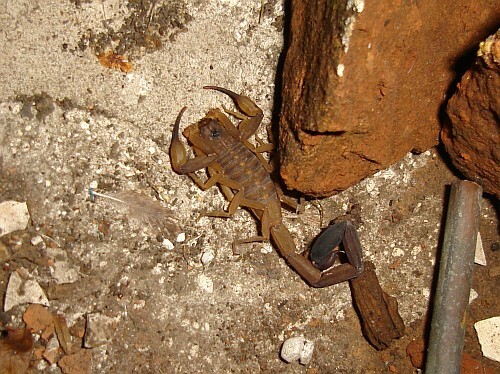 Several of the scorpions I keep were collected on the roof of our house in Xalapa, Mexico, under a stack of stones and tiles. They have been identified as Centruroides flavopictus (Pocock, 1898), family Buthidae, by Rolando Teruel. On five occasions (so far) Centruroides flavopictus has been found in our house. Either hiding in towels (twice), in the bathroom (once), behind cushions (once), or even just walking on the ceiling (once). MexIT is a blog I keep, and it has several entries regarding scorpions.